I have the day off! Oh the places I could go, the adventures I could seek. Reality is: Oh the leather furniture thirsts for polish, the cob webs on the ceiling aren’t Halloween decorations. Should I do chores on my day off? Nah, life is too short to not bake and bake I did. 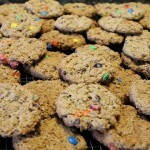 Soft, chewy, flourless oatmeal monster cookies. It was just the right remedy to ease the “almost got rear-ended on the freeway” kind of week I had. Thankfully, the dude in a taupe SUV screeched to a halt a few millimeters from my bumper. People, let’s pay attention! There have been far too many accidents from negligence and a fatality last week at that! Public service announcement is now over and I’m back to being happy on my day off with sunny skies, crisp air, bright autumn colors (ignoring the ones on the ground that need raking), and a spread of warm, freshly baked flourless oatmeal monster cookies across my island counter. Life is good. There will be a scattered montage of shoes in assorted styles and sizes at the front door, sprawled out legs covering the family room floor, and the sound of laughter and camaraderie filling the air and two cheesy hearts. (Hunky Hubby and I are oozy cheesy that way and proud of it!) 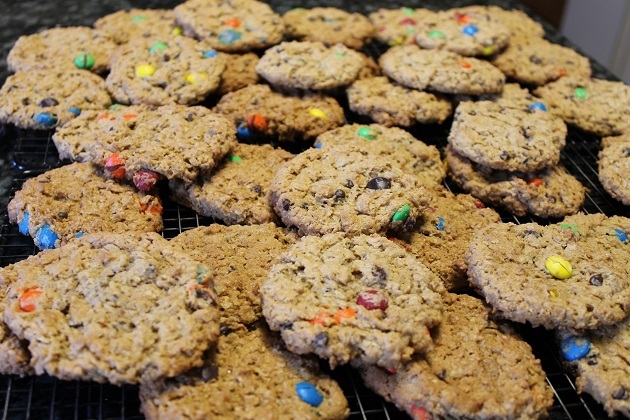 The mound of flourless monster cookies will surely be devoured along with a variety of other sweet and savory noshes and I will likely need to gulp a few times and bat away misty eyes because my baby is checking off some of her final high school events. For now I’ll just enjoy cookie #2 with a cup of coffee and tell you all about these yummy flourless oatmeal monster cookies. 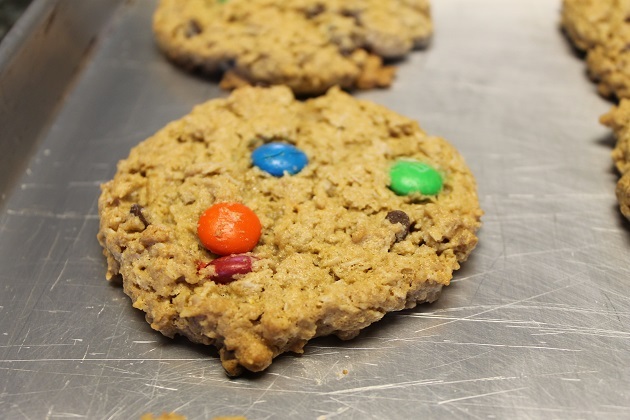 If you too are a chewy cookie lover who will take soft-baked over crispy any time, you will need to call in the will power reserves to only eat just one. Okay, only eat just two. These cookies are scrumptious and kudos to my friend, May, for sharing her recipe that I halved and only tweaked a tiny bit. I used light pancake syrup in place of plain corn syrup simply because that is what I had on hand and with such a teeny tiny amount no one will know the difference. I also added one-half cup of mini chocolate chips and one cup of colorful chocolate candy pieces as to not overpower the peanut buttery-ness of these decadent cookies. I just may go polish furniture, clean away cob webs and rake some leaves. May day has been full of sweetness and may yours be too. Enjoy! Add peanut butter, vanilla and syrup and beat again until well blended. Add eggs, one at a time, lightly stirring in between..
All at once, add baking soda and rolled oats and mix until well incorporated. Add all of the chocolate and mix again. Using a cookie scoop, drop onto ungreased pans at least 2-inches apart. Bake 13-15 minutes. Carefully transfer to wire rack to cool. I have a horrible habit of not deleting photos after downloading them. I need to be sure and double, triple check before I delete. Drives Hunky Hubby crazy. Well, this time my paranoia has served us well. Me, and you. As the cold October winds are beginning to blow, I was swept away to warmer days as I clicked through the photos on my camera. That’s when I saw it: this scrumptious bowl of bacon and blue cheese potato salad and was reminded that I was remiss in sharing it with you. We skipped a true family vacation this summer what with my starting a new job late last fall and skimping on vacation time. So I stayed behind while eldest Beauty took in the sights, sounds, and tastes of Paris and Barcelona and Hubby and baby Beauty heeded the call from the Rocky mountains. Sometimes a mom stay-cation isn’t such a bad thing…especially when one scores a 5 lb bag of Maytag blue cheese directly from the Maytag Dairy Farms in Newton, Iowa. 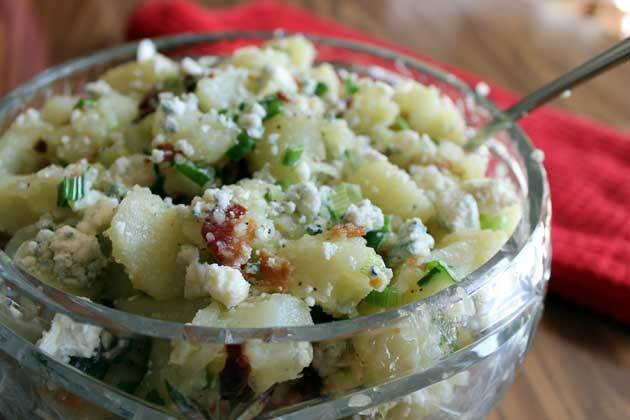 This hand made, cave-aged cheese is well-deserving of its world famous, prize-winning notoriety and is the star ingredient of this completely addicting bacon and blue cheese potato salad. At first bite any notion of low carb eating will be out the window. Bacon and blue cheese are two flavors that are meant to be married and deliciously compliment each other. The crispy, salty bacon paired with creamy, pungent Maytag blue cheese. My mouth is watering as I type. 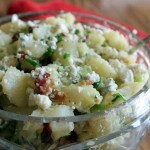 I intended to make a small, dinner-sized bowl of bacon and blue cheese potato salad to pair with grilled beef kabobs. I must have been really hungry as we had ample servings of leftovers for the next two days. No complaints from me but that is my disclaimer for the recipe that follows. It really does yield upwards of 10 servings. Not a fan of blue cheese? Substitute goat cheese or feta cheese for a milder flavor. I’m off to go delete photos from my camera. Enjoy! 6-8 slices low sodium bacon, cooked and crumbled. Boil potatoes until fork tender. When cool, peel the potatoes and dice into cubes. In a medium size bowl, add potatoes and remaining ingredients. Using a spatula, gently fold to thoroughly combine. Hello Blog World, it’s good to be back! Here we are a few days shy of 4 months since my last post and what a 4-month ride it has been. 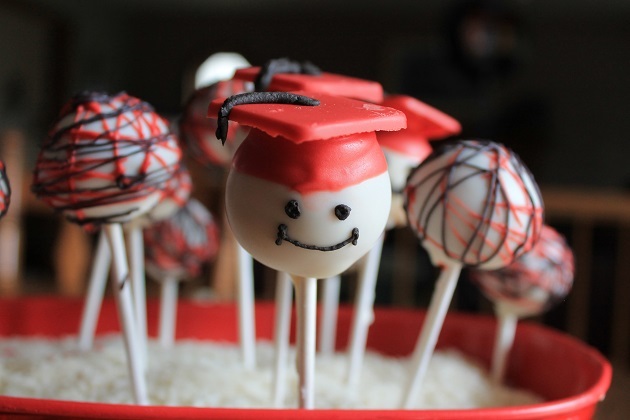 Earlier in the year I was beginning to blubber over my firstborn baby’s high school years coming to an end and life soon taking a new turn and a new rhythm. Had I not had the experiences I did these past months, I would be a soggy mess. Admittedly, I had a few mom-moments as my eldest accepted her diploma, but my heart wasn’t heavy. It was – and still is – swelled with sheer joy and thankfulness at the opportunities that lie ahead for both of my beauties. And who knows? Maybe this new chapter in life will mark a new beginning for me and I’ll post with some degree of steady frequency. One can always hope. Meanwhile, today I’m sharing a recipe for the cheesecake fruit tart our family enjoyed after graduation, a longtime family favorite. 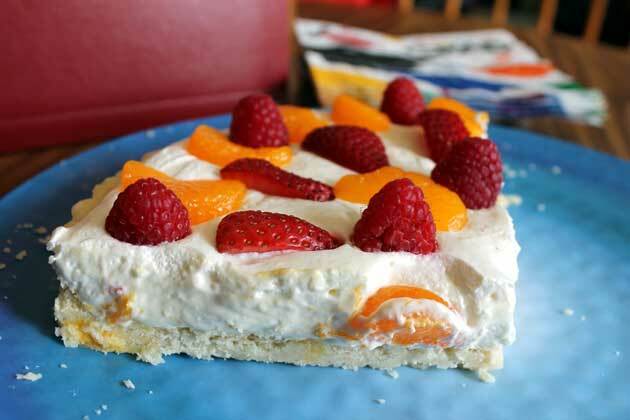 You’ll need a true tart pan for this cheesecake fruit tart recipe as the sugar-cookie crust is filled with a light cheesecake filling that is not firm enough to use as topping should you make the crust flat as for a fruit pizza. It is not runny cheesecake filing, it does firm up, but if you’re like me and you like a lot of filling it won’t work for fruit pizza. Having a border crust helps to hold the cheesecake filling in, providing a yummy bed for whatever fruit toppings your little ol’ hear desires. In my case, it is a limited selection of fruit toppings that will not send my sister to the ER with anaphylaxis. 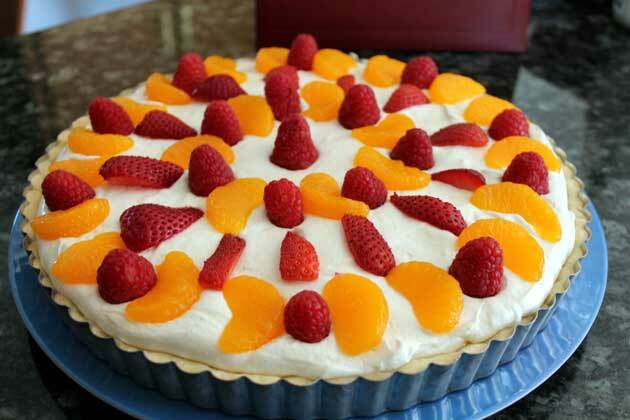 This cheesecake fruit tart recipe is a combination of two recipes; a perfect marriage of flavors that makes for a delightful and versatile dessert. Note: You will have cheesecake filling left over that I urge you to consider as reward for preparing the dessert. Enjoy those smooth-and-creamy-spoonfuls of cheesecake filling without a teaspoon of guilt over not sharing. Tell yourself you deserve it! Works for me every time. Begin by preparing the crust. Cream butter and sugar until fluffy. Add flour and mix until well blended. Press into an ungreased 11- or 12-in. fluted tart pan with removable bottom or 12-in. pizza pan with sides. Bake crust at 300° for 25-30 minutes or until lightly browned. Cool completely on wire rack. “Tuna” and “elegant” aren’t often used in the same sentence, but this white bean tuna salad with Dijon vinaigrette is an exception! WOW! 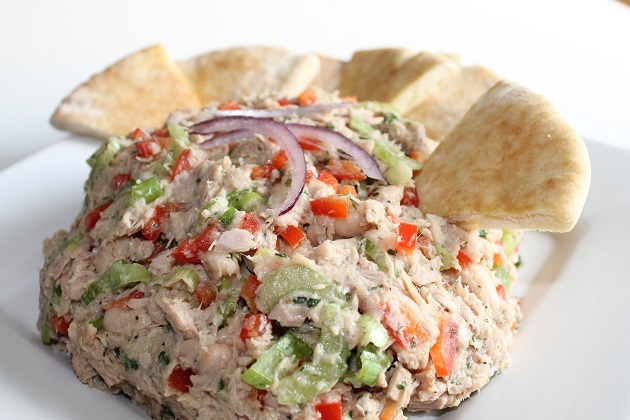 It’s a tuna salad that is elegant enough to stand front and center on a luncheon buffet table and humble enough to make a typically humdrum work lunch feel a little special. Back to business. I was in the mood for tuna but not in the mood for a mayonnaise-based salad. Being the mustard lover that I am, and trying to incorporate more veggies in my diet, I created this white bean tuna salad with Dijon vinaigrette recipe. And gave my recipe a very descriptive title. Gently mix diced celery, sweet red bell pepper, and green onions with Great Northern Beans and tuna fish. Toss it in a light Dijon vinaigrette dressing, add a dash of dill and black pepper, and lunch is served. 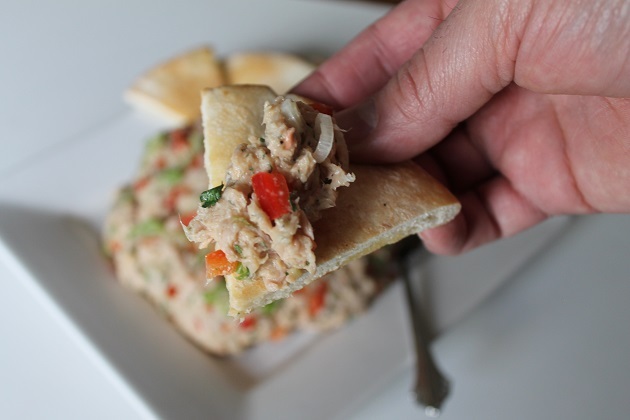 Whether you mound a scoop onto a toasted bun or enjoy a healthy dollop on a pita toast triangle, you will gain a whole new appreciation for tuna salad. The white beans add an extra punch of protein and the Dijon vinaigrette is made with extra virgin olive oil, a good fat. My mother is a tuna fish snubber. Actually, she is an overall seafood snubber who turns 100 shades of green at the slightest whiff of even the freshest catch. Never mind a can of tuna. My firstborn inherited that recessive gene, although she enjoys an occasional tuna salad and gave my recipe a two forks up rating. I hope you do, too! Gently mix all ingredients except dressing in a large bowl. In a separate bowl, blend vinegar and mustard, slowly add oil, beating well to emulsify. Pour over salad and mix lightly to not mush the beans. NOTE: This is not a wet salad. If you prefer a wet salad, double the dressing ingredients. Tender, bright green asparagus is one of the sure signs that spring has sprung…and a reminder to get eating light to begin feeling light after one very heavy winter. Hubby bought the first young bunch of the season’s delicate, thin-stemmed stalks and it didn’t take me long to figure out what to do with such a treasure. Prepare what has to be the easiest and snazziest veggie side dish there is to make: sauteed asparagus with balsamic glaze. It’s a snap to prepare, even for novice cooks (me, 25 years ago). Speaking of snap, one quick snap is all it takes to remove the woody stems. Simply bend each asparagus stalk until it snaps, collect the tough ends and proceed to find the pair of rabbits that moved into the neighborhood over winter. They’re now rather chubby bunnies who could probably use the extra roughage. 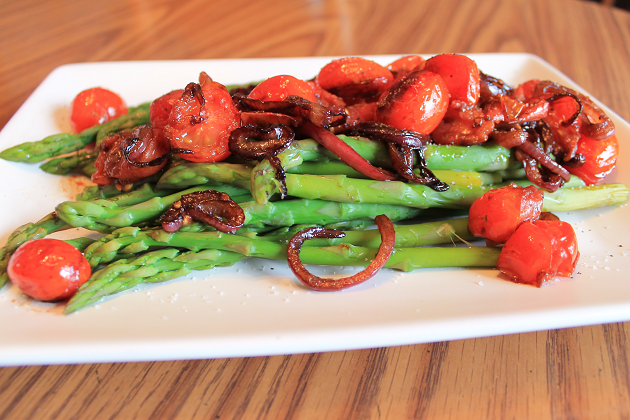 After steaming the asparagus in a covered skillet, sautee one cup of grape tomatoes (if they’re too large cut them in half) and half of a thinly sliced red onion in one tablespoon of extra virgin olive oil. Add two generous tablespoons of balsamic vinegar to deglaze the pan. Savor the waff of aroma swirling in the air before covering and simmering for two minutes. 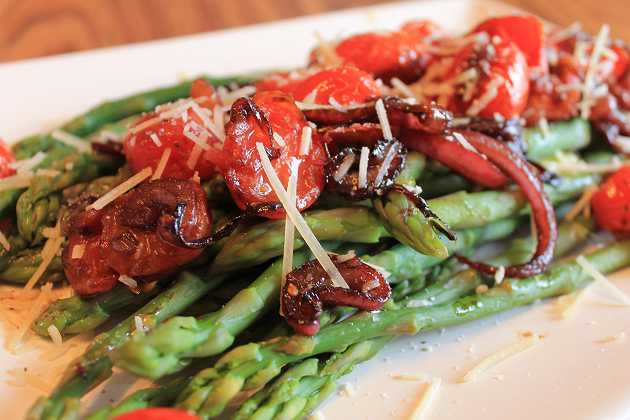 Pour mixture over the steamed asparagus and for a little extra pizzazz top the sauteed asparagus with balsamic glaze with a dusting of shredded Parmesan, or serve it as is for an equally delish vegan version. Authentic balsamic vinegar is a pricey condiment but if you can swing it, it’s well worth it. Originating from the Modena region of Italy, true balsamic vinegar is made by boiling and reducing Trebbiano grape pressings to a deep, dark syrup. After a fermentation and aging process, the end result is a thick, robust, concentrated flavor that is out of this world. If desired, top with a dusting of grated Parmesan cheese. This is a celebratory post in honor of the glorious sun that has returned, the balmy 40F degree temperature these past two days, and for my not catching spring fever until now. In past years I’ve had the itch to break out the spring decorations before Valentine’s Day. I made it until March 8th this year, only twelve days shy of the official first day of spring, and that, my friends, is cause for celebration. So… in honor of the aforementioned details, I’m posting this recipe for Greek Chicken Burgers served hoagie style. It’s a spring-y sandwich. Fresh. Green. Light. And tastes as delightful as it looks! Serve as traditional Greek chicken burgers, form into oval patties and serve hoagie style as I did (with plenty of tzatziki sauce), or form meatballs around skewers and refrigerate 20-30 minutes before grilling to serve as keftka kabobs. 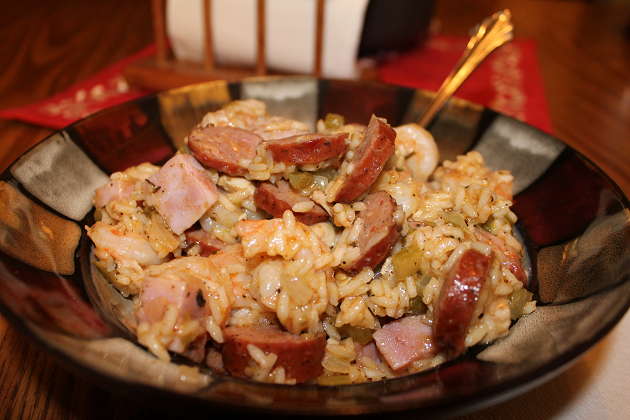 I’ve been remiss in posting this awesome recipe because life has been on turbo charge the past few weeks. I say that with gratitude and not complaint. It’s all good, though being MIA from my blog also serves as a reminder that sometimes I just can’t fit everything in —and it’s okay. Everything has it’s own time. And it’s time for me to share these Greek chicken burgers with you! 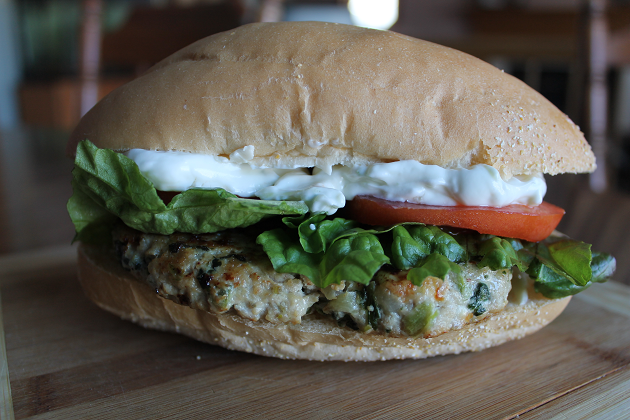 There are over 2 million other listings for Greek chicken burgers but I betcha the majority are made with spinach. I used kale. Pretty sneaky and quite a shock to my Loves who know I am not a card carrying member of the kale fan club. I had a toe in the door for the longest time, though after making this soothing soup and now these yummy Greek chicken burgers, I’m dangling a leg through the door. Baby steps, people, baby steps. Heat oil in a skillet over medium heat and saute onions until golden. Add kale and saute for 2 minutes. Remove from heat and allow to cool. In a large bowl, add vegetable mixture to ground chicken, granulated garlic and black pepper. Gently mix, folding in feta cheese. Form into desired shapes and either pan fry or grill until cooked through. 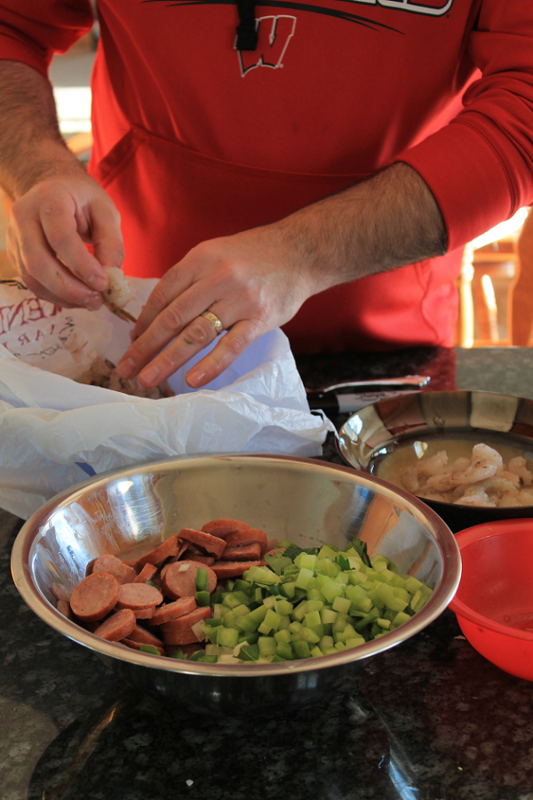 To prepare Tzatziki, mix all ingredients in a small bowl and refrigerate to allow flavors to blend. You never know what treasure you’ll find at the bottom of the freezer. Like a small well-packed pack of Serbian cupavci. That sure beats a small not-so-well packed unidentifiable freezer-burned foiled object. 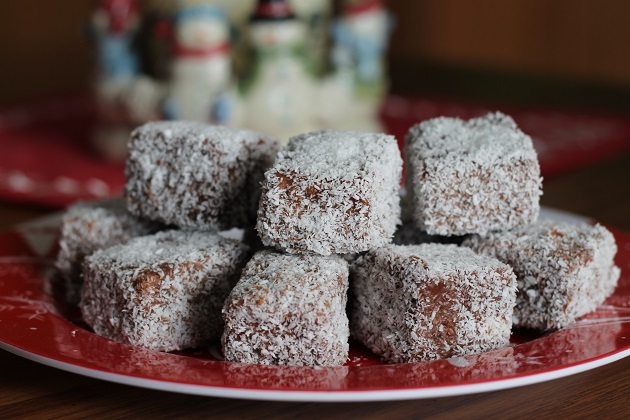 Cupavci are one of my family’s favorites and having one last taste of the Christmas season was well worth nearly crawling into the little chest freezer to dig it out. We’re a two-freezer family. 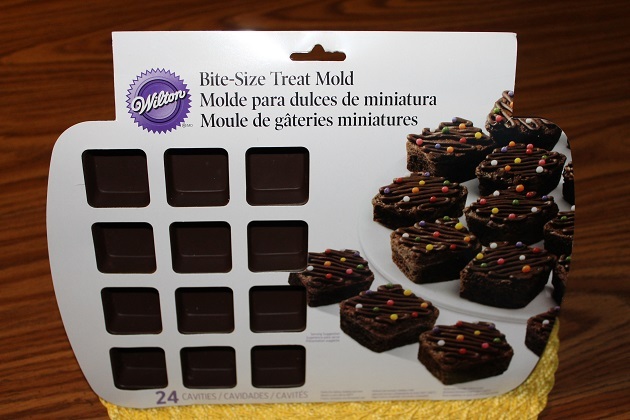 Actually one and a half as the chest freezer is the small “extra” freezer – the first one Hubby and I bought. And the one that I’m trying very hard to clear out and unplug until late next fall. Next fall. Sniff, when my firstborn who turned 18 last week will be leaving the nest for college. BIG sniff. Now back to cupavci. Never heard of them? 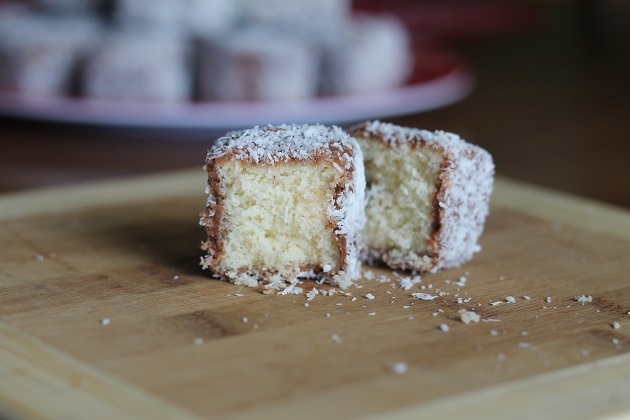 You might know them as Lamingtons, or maybe not that either. Well, let me say, you must try them. Cupavci are the perfect portion control sweet. If you can eat just one, or two. 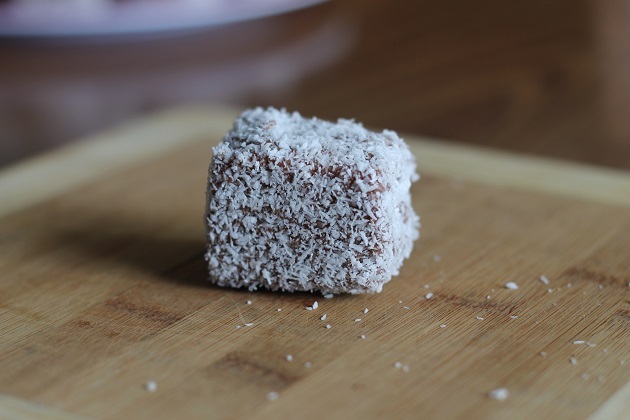 Serbian cupavci are made by cutting a deliciously moist hot milk sponge cake into small squares or rectangles, dipping each individual morsel in a layer of chocolate glaze (you decide the thickness) and then cover it in sweet desiccated coconut. Mmmm, mmm. It was one last taste of Christmas just as we’re quickly approaching the start of Great Lent. We’re still very much in the throws of winter here in Wisconsin, though it’s so nice to have teeny weeny signs of change becoming increasingly more noticeable. Small signs like driving my Beauty to jazz band in daylight and driving home from work in daylight. Even the somewhat annoying reminder that I heard much of the afternoon today: the loud dripping sound of melting snow from the gutter outside my home office window. Ahhh! Spring is on the horizon but I’m not going to let myself get spring fever quite yet. There are still weeks of winter ahead, especially if that hairy Punxsutawney groundhog called it right. By the way, cupavci is slang for cupav: hairy, unkept. Perhaps it’s the messy coconut that drove the naming convention or the fact that the squares and be cut in varying shapes so I suppose they can look a bit haphazard on a plate. I really don’t know. But I do now I struck gold in my freezer dig today. TGIF with a mile-long repeat of exclamation marks! It’s been one of those weeks (more on that later), but knowing that tomorrow will be an alarm-less morning has already put a sweet spin on my morning. It’s hard to believe that just last week was Bozic, Christmas for Orthodox Christians, and a few last cookies that I’ll pack in lunches are a pleasant reminder of the warm day my family shared in celebrating of Jesus’s birth, despite the zero temperature and sub zero wind chill. Some new found delights mixed in with longtime family favorites graced my dessert table this year, including these dark chocolate covered fruit and nut balls. The mixture of ground fruit and pecans coated in a generous layer of dark chocolate are bites of indulgence. As I may have mentioned, a 40-day fasting period precedes Christmas and these fruit and nut balls are covered in my favorite brand of vegan dark chocolate – Trader Joe’s. 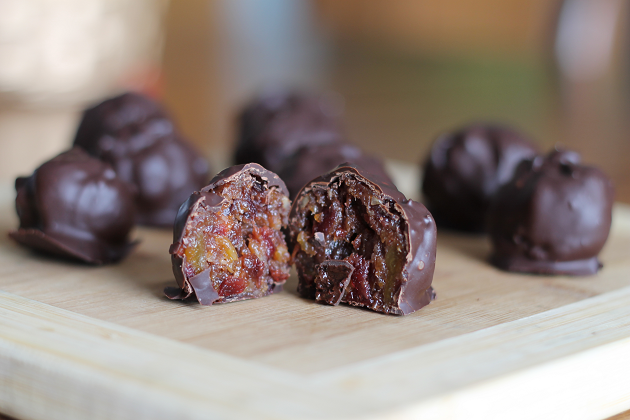 I used a mixture of dried apricots, dried mixed berries and dried cherries with ground pecans. It was delicious but next time I’m going to try using pistachios. Any combination of dried fruit would work so experiment away! In a saucepan, combine dried fruit and water. Heat to boiling. Using a slotted spoon, place fruit in a food processor with 2 tablespoons of honey and pulse until a paste forms. If mixture is too thick, add some of the cooking liquid one tablespoon at a time. Form into balls of desired size and place on wax paper-lined pan. In a small saucepan, melt ½ lb. dark chocolate with 2 teaspoons of canola oil. 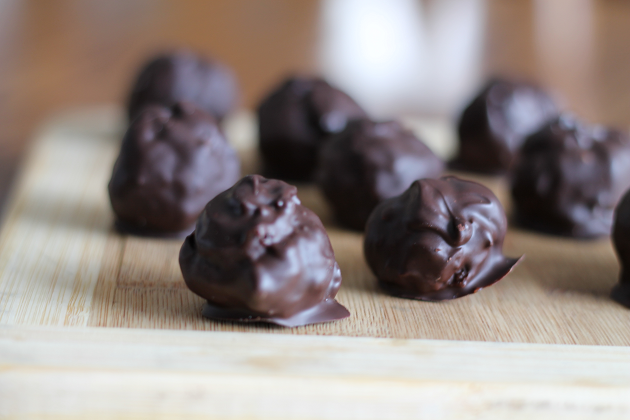 Dip balls into chocolate and place on pan to dry. Next year, these dark chocolate covered fruit and nut balls will make an encore appearance on my cookie tray though it’s unlikely I’ll wait until then to make them again. Lesson learned this time around: it doesn’t take long to roast pecans. I had painfully toss a batch and learned that sometimes it’s not good to multi-multi-task.